Under this segment, we plan to establish an International Meditation Centre and a Centre for Mental Well-being. This Centre will be constructed, complete with facilities conducive to the development of physical and mental well-being of people, both local and foreign. The Centre will be adapted to its locale. This Board will be made up of Monks who are engaged in meditation and of Guides of Mental Development. The following are the constructions that are proposed for this Project. An office to maintain the buildings of this institution and a home from which various service operations are conducted. Thirty cells, equipped with modern facilities, constructed mainly in wood, conducting to physical and mental health. A Meditation Hall, with accommodation for a large group to mediate together. A building with state-of-the-art equipment, that could be utilised to achieve mental well-being. We intend to set up a Centre of Indigenous Medicine that gives pride of place to indigenous therapy that is getting faded from our society in our health development schemes and a Garden of Medicinal Herbs, needed for that therapy. We intend to maintain this Centre, fully equipped with the material and human resources, along with a Medical Team, that could meet the requirements of both local and foreign patients. The following are the proposed constructions for the activities of this Centre. An office for construction work and maintenance and a house for service operations. Constructions needed for the Ayurvedic Residential Medical Centre. In this segment our special attention is focused upon the youth groups who drop out of the formal school education. Vocational School Building (Computer Unit, Driving School, Motor-Mechanics etc., will be included in the curriculum). The primary aim of this segment is the economic empowerment of the poor and underprivileged people of this region. To achieve this purpose, we intend to establish a fully-equipped Diary Farm. This Diary Farm will consist of vegetable cultivation, growing fruit-trees, cultivation of paddy etc. For the activities of this Dairy Farm, the labour of the poor people in this region will be utilised. We plan to take steps to pay them a wage that will enable them to improve their standard of living. The following are the constructions proposed for this. At a time when deforestation has become a serious problem, Podi Hamuduruwo has taken the initiative in a massive reforestation project. 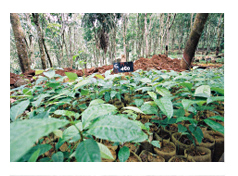 A ‘Tree Bank’ with a wide variety including teak, mahogany, jak and herbal plants has been established in a 740-acre property at Urumutta Estate, Akuressa. Plants from these nurseries are regularly distributed among those interested. A block of land with rare species of trees adorns the site of the rest rooms at Kataragama.